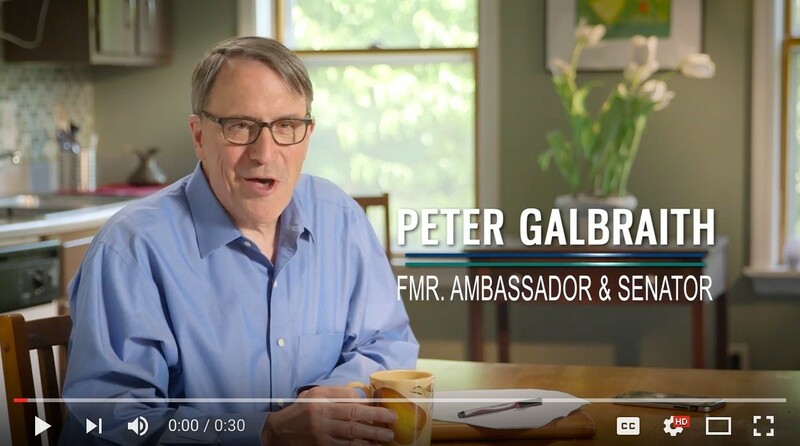 Former state senator Peter Galbraith released his first television advertisement of the gubernatorial campaign Tuesday, becoming the fourth candidate in the race to hit the airwaves. The ad features the Townshend Democrat sitting at a kitchen table — his hand grasping a mug decorated with a peach — highlighting his progressive bona fides. He notes that he authored a law banning hydraulic fracturing, though he neglects to mention that no fracking had been planned for Vermont when he introduced the legislation. Galbraith pledges to raise the minimum wage to $15 an hour and make tuition at state colleges free — paid for by "ending special-interest tax breaks." And he signs off with a nod to Sen. Bernie Sanders' (I-Vt.) declaration that his presidential campaign was not financed by billionaires, saying, "Paid for by Galbraith for Vermont — not the special interests." The ad also makes reference to Galbraith's diplomatic career, featuring a photo of then-vice president Al Gore swearing him in as ambassador to Croatia and another of him sitting with the late prime minister of Pakistan, Benazir Bhutto, a longtime friend. According to files maintained by the Federal Communications Commission, Galbraith has ordered up $34,310 worth of airtime on four Vermont television stations, starting Wednesday and running for a week. In a press release, his campaign described it as the beginning of a "six-figure media buy." Galbraith is the last major Democratic candidate to go on the air. Former state senator Matt Dunne did so three weeks ago. Former transportation secretary Sue Minter followed suit a week later. On the Republican side, retired Wall Street banker Bruce Lisman has been on television since February, while Lt. Gov. Phil Scott has yet to air an ad.